This post is part of the special series Vehicle Sales 1976-2010. The main factor affecting domestic vehicle sales is the market size. The market for automobiles consists of the personal market and the corporate and public-sector markets. I decided that the best way to measure the market size was to look at the number of licensed drivers and the number of potential drivers. 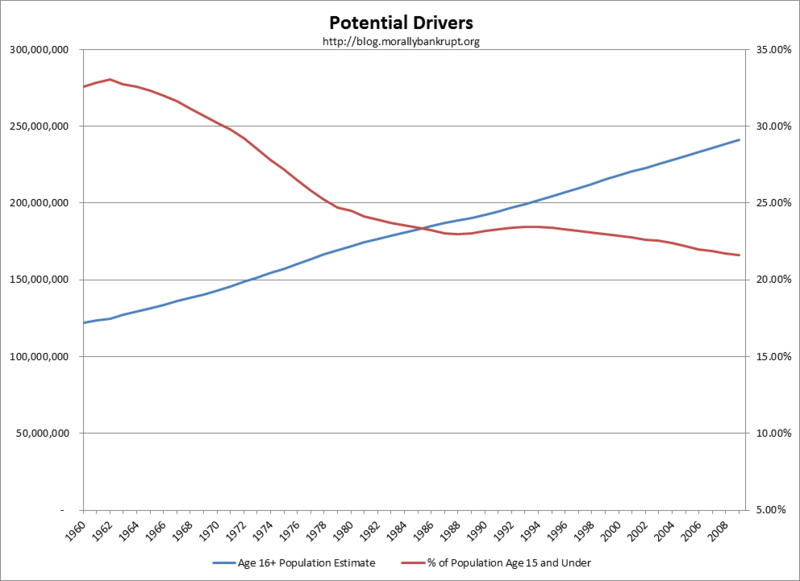 As previously mentioned in the introduction to the series, potential drivers are people age 16 and older. The number of licensed drivers was taken from numbers published by the FHWA. 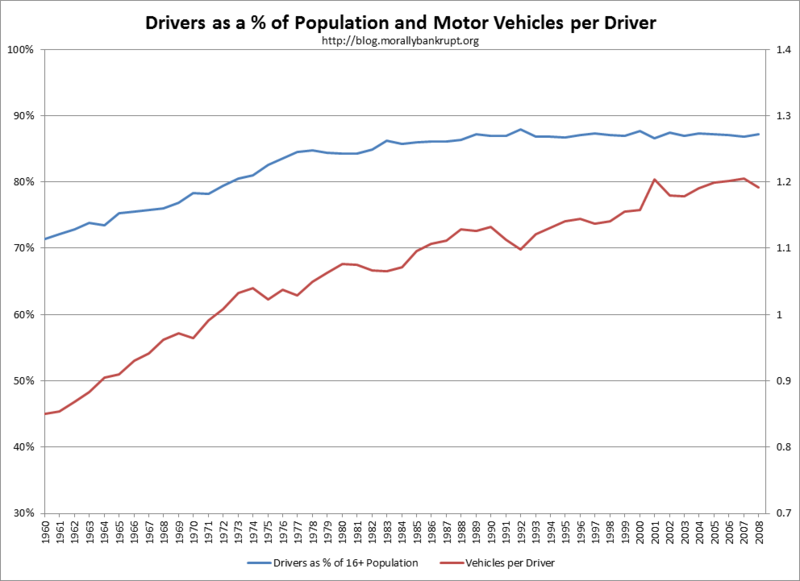 In order for the domestic vehicle fleet to increase we must have an increase in the number of drivers, an increase in automobile ownership, or a combination of the two. ﻿The chart clearly shows a relatively smooth increase in the number of residents age sixteen or over, which are candidates to be drivers in blue. In red is the percentage of residents age 15 and under. As can be seen, this number has been on a decline since 1962. 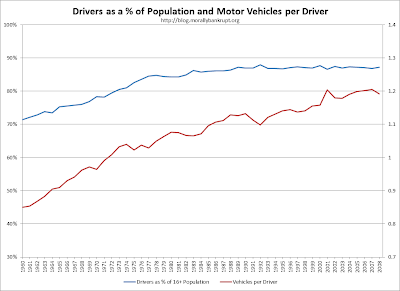 From this data we can reasonably deduce that we can expect no major demographic reason for an abnormal increase in the potential drivers in the near future. In fact, the number of potential drivers as a percent of the population may be close to reaching it's upper limit. 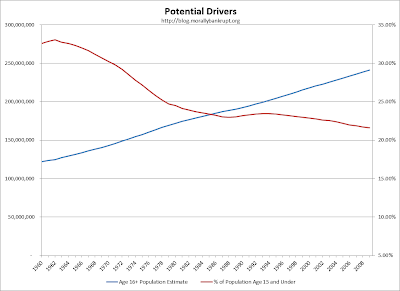 ﻿﻿In this chart we can see that for the last 40 years the number of drivers as percentage of the potential drivers (residents age 16+) has essentially plateaued. This means that the growth in drivers (potential purchasers of motor vehicles) should now generally follow the growth in population. Not every person sixteen or older will be a driver and it looks like the stable number of licensed drivers is 87-88% of the 16+ population. We've also seen the number of registered vehicles rise from .85 vehicles per licensed individual to 1.2 vehicles per licensed individual. Driver-less vehicles may be a possibility in the future but, in the present, a vehicle requires a driver. This means that at any point in time no more than one vehicle per licensed driver should be in use. Taking this into consideration, it seems reasonable to expect a natural ceiling in the number of vehicles per licensed driver. Once that range is reached, the growth in the total number of registered vehicles should be similar to the growth in the number of drivers.